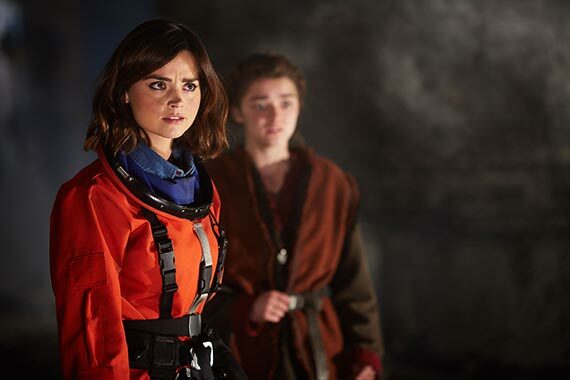 Doctor Who: THE GIRL WHO DIED Spoiler-Filled Review | Warped Factor - Words in the Key of Geek. Whether you love The Girl Who Died or not depends largely on which story you watch. If you watch the ‘alien invasion’ story – meh. The Mire are a bit naff in either incarnation, to be fair – big walking tanks or headfuls of teeth, they look more Sarah-Jane than proper Doctor Who, and the idea of defeating them with a dodgy puppet that transforms into a dodgy CGI dragon, and then threatening their reputation with uploading the footage of them running away to the Benny Hill theme is a fine comedy idea, but overall a bit lightweight. So if that’s what you’re watching when you watch The Girl Who Died, we can understand why you might not be entirely blown away by the episode. Psst – the clue is in the title. You’re not really meant to be watching Invasion of the Mire. If you were, the episode would probably have been called Invasion of the Mire. Look again. Literally, look again – it took me two watches to click with The Girl Who Died. Would you like another clue? It’s called The Girl Who Died. Laugh it up by all means, there’s some great comedy here - but don’t mistake the story for a thing of no consequence. Now that we’ve got that out of the way, let’s take a look at the real story. The pre-credits sequence has upside-down space Clara and grumpy, stampy Doctor action, some solid comedy, and a couple of chilling lines – check out the Doctor’s reaction to Clara’s gag that he ‘is a tidal wave.’ It’s as though they’ve casually been chatting about serial killers when she chuckles “You are a serial killer.” He looks like all his worst nightmares have crawled out from under his bed to grab him. Then, in half a heartbeat, they’re off to see the Vikings, because a sword in the gut can really put a crimp in your day, and the Vikings clearly have yet to be convinced that sonic shades are cool. The Doctor makes a singular mistake several times in the first half of this story – the first this year by Series 8 Mummy/Flatline wunderkind Jamie Mathieson (this time co-written by Steven Moffat) – he underestimates the locals, even flat-out condescending to them with the shades and the yo-yo. What a day these Vikings are having, though – you wait your whole life for Odin to turn up, then two come along in a matter of minutes. When the fighting Vikings are turned into the alien equivalent of Red Bull, Clara shows the kind of citizen of the universe she’s becoming – capable, clever, unafraid of dangerous situations and confident of her ability to talk her way out of things. Which is fine unless you have an emotional Viking girl by your side, more than a little upset about having her friends and relatives juiced to death. Annnnd so the war is on. Look at the quality of the writing that follows – if the pre-credits didn’t give this away to you, we’re in sparkling territory here, with many of the lines deserving T-shirts, but even more deserving a rewind to listen again. The Doctor puncturing the enthusiasm of his hosts – “Do babies die with honour?” His bringing them down to earth – “What are you gonna do, raise crops at them?” and the like are superb little jewels of levity or lead strewn throughout the script, but listen to the Doctor translating the cries of the baby – previously an excuse for much Stomageddon, Dark Lord Of All-style fun – and feel your heart break with the lyricism that resonates with the culture of the Vikings, their epic songs and stories. The training sequence is an excuse for more fun, but it shows how the Doctor perceives his limitations – he can’t teach them to win, because that would bring the Mire and so many others back, drawing attention to an Earth ripe for conquest or destruction. All he can do is teach them to die with honour, which will sickly satisfy everyone in the equation. Here we have the strongest evidence to date that she’s the Anti-Jiminy Cricket, the little voice in the Doctor’s head daring him to be dangerous, not so much a Guardian Angel as a Guardian Demon, pushing him to break the rules he knows exist, pushing him to do what he can to win, above all, to find that pathway to victory no matter what. And he does, and the cost of that is the death of someone he likes, someone innocent who got caught in the crossfire and used by this Doctor who can do anything to win. 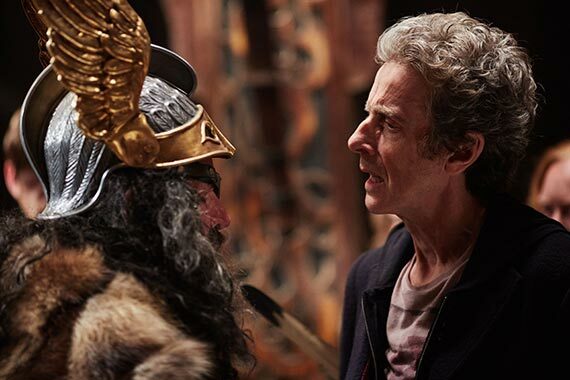 When he mourns the death of Ashildr, she’s ready, as ever, and as we all might be, to mince it for him, to spout the platitudes that let a person go on doing what they need to do – it’s not your fault, you did your best – and there, right there is our Doctor’s point of crisis. ‘I can do anything. There’s nothing I can’t do’ – he sounds like The Time Lord Victorious in that moment, the dangerous powerful force of will that could turn the universe inside out, and when he gets his moment, his memory of his Tenth incarnation, of Donna begging him to save jut someone, he understands who frowned him his face, screams “To Hell with you!” at time and space and causality and runs off to save Ashildr’s life by making her an impossible thing, another Jack Harkness, an immortal, because, and this is crucial, it’s what he wants to do. He finds the reason to do what he wants to do, not what he’s allowed to do, or what he should do – and you could easily argue that he gets it absolutely wrong. When Donna begged him to save just someone, the Tenth Doctor was prepared to let the whole of Pompeii burn to keep the timelines intact. “Just someone,” she pleaded, and then it was an act of mercy, a touchstone to stop the Tenth Doctor going cold. But the Twelfth Doctor has already interfered, already stepped in to cause a tidal wave, defeating a vastly superior alien force and saving the whole village. But that’s not enough of a victory for him – he wants to save one person, one special person, and for that, he says, he’ll lose any war you like. He goes beyond the rules, the laws, the approval of any silent Time Lord observers, because he wants to, because he needs that victory – because his tally of regrets is building too high. The speech here from Mathieson and Moffat is masterful, letting us peek inside our Doctor’s mind more than ever before, and it brings us dark foreshadows when he says to Clara that one day she won’t be there and it will hurt him so much, and haunt him everywhere. It’s a speech, and a scene, and an episode that makes us ask: what kind of cataclysm can possibly tear these two apart? Will Clara die? Will the Doctor have to escape her influence? Will he become something she can’t forgive? The Girl Who Died takes a second watch for some fans to get beyond the quality of the comic writing to see it’s not just a comedy episode. It takes a second watch to get beyond the naffness of the Mire, to see that it’s absolutely not about them. 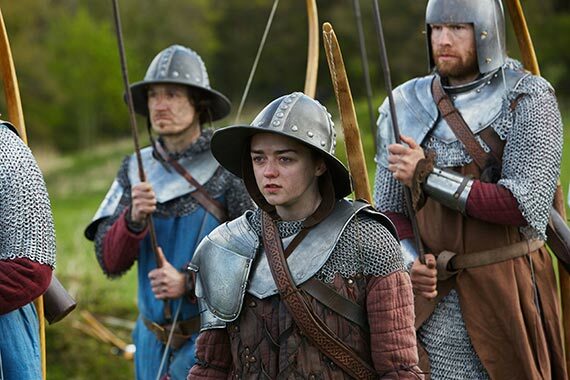 The episode is about The Girl Who Died – in this instance at least referring to Maisie Williams’ very natural Ashildr – and the consequences of that death, most particularly on the Doctor and his view of the universe and his place in it. His actions here feed the foreboding sense of existential angst with feels like an underlying arc for this series – the Doctor going beyond, breaking rules, and putting off the consequences…until they can’t be put off any more. If you still needed a curiosity-hook to get you into this series and to absolutely not let go, rewatch The Girl Who Died. In Series 8 he asked if he was a good man. In Series 9, the Doctor’s running to discover himself – but The Girl Who Died makes us ask whether he can live with who he’ll find.